This article is about the play by David Auburn. For other uses, see Proof (disambiguation). Proof is a 2000 play by the American playwright David Auburn. Proof was developed at George Street Playhouse in New Brunswick, New Jersey, during the 1999 Next Stage Series of new plays. The play premiered Off-Broadway in May 2000 and transferred to Broadway in October 2000. The play won the 2001 Pulitzer Prize for Drama and the Tony Award for Best Play. The play concerns Catherine, the daughter of Robert, a recently deceased mathematical genius in his fifties and professor at the University of Chicago, and her struggle with mathematical genius and mental illness. Catherine had cared for her father through a lengthy mental illness. Upon Robert's death, his ex-graduate student Hal discovers a paradigm-shifting proof about prime numbers in Robert's office. The title refers both to that proof and to the play's central question: Can Catherine prove the proof's authorship? Along with demonstrating the proof's authenticity, the daughter also finds herself in a relationship with 28-year-old Hal. Throughout, the play explores Catherine's fear of following in her father's footsteps, both mathematically and mentally and her desperate attempts to stay in control. Originally produced by the Manhattan Theatre Club, opening on May 23, 2000, the play transferred to Broadway at the Walter Kerr Theatre on October 24, 2000. Directed by Daniel J. Sullivan, the production starred Mary-Louise Parker as Catherine, Larry Bryggman as Robert, Ben Shenkman as Hal, and Johanna Day as Claire. Later during the Broadway run, Jennifer Jason Leigh (September 13, 2001 to June 30, 2002) and Anne Heche (July 02, 2002-January 05, 2003) took over the lead role. Josh Hamilton and Neil Patrick Harris subsequently played the role of Hal. Mary-Louise Parker won the Tony Award for her performance, and Daniel Sullivan won the Tony Award, Best Direction of a Play. The play closed on January 5, 2003 after 917 performances. 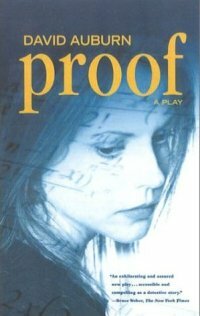 Proof premiered in the West End at the Donmar Warehouse in May 2002, to June 15, 2002. Directed by John Madden, the cast starred Gwyneth Paltrow as Catherine, with Ronald Pickup as Robert, Sara Stewart as Claire, and Richard Coyle as Hal. London's Menier Chocolate Factory produced the play from March 13, 2013, to April 27, 2013. It featured Mariah Gale in the role of Catherine, and Polly Findlay directed. The play premiered in Australia at the Sydney Opera House in 2003 starring Jacqueline Mckenzie and Barry Otto and directed by George Ogilvie as a Sydney Theatre Company production. In April and May 2013, a new production by the Whitmore Eclectic Theater Group opened in Los Angeles at the Hayworth Theatre for a limited run. James Whitmore Jr., son of the award-winning iconic actor James Whitmore, starred; and his daughter Aliah Whitmore directed. A production in May 2013 opened at Carolina Actors Studio Theatre in Charlotte, North Carolina. In September to October 2013, Proof was directed by Emily Mann at the McCarter Theatre in Princeton, New Jersey. London's Tabard Theatre produced the play from 29 September to 24 October 2015, directed by Sebastien Blanc (son of Raymond Blanc). It featured Tim Hardy (Royal Shakespeare Company Marat/Sade) as Robert, Julia Papp as Catherine, Mary-Ann Cafferkey as Claire and Ian Charleson Awards nominee Kim Hardy as Hal. A Seattle production opened in January 2017 at Strawberry Theatre Workshop with three TPS Gregory Award winning actors, Anastasia Higham, Charles Leggett, and Allison Standley in principal roles. Proof was directed by Greg Carter on the Mainstage at 12th Ave Arts. It was the first professional production in Seattle since 2004. A 2005 film adaptation was directed by John Madden, starring Gwyneth Paltrow as Catherine, along with Anthony Hopkins, Hope Davis, and Jake Gyllenhaal. Adapted by Rebecca Miller, the film version added more characters (in minor supporting roles), whereas the play has only four. ^ Jones, Kenneth. "Broadway's Proof, of Math, Memories and Mary-Louise Parker, Opens Oct. 24". Playbill.com. Retrieved 31 July 2015. ^ "Gale has Menier Proof". OfficialLondonTheatre.com. 29 January 2013. Retrieved 31 October 2017. Wikimedia Commons has media related to Proof (play).